Why am I posting a Christmas cookie in September? “You do know that it’s Labour Day?” – Yes, I am aware. It’s obviously because I’m so excited for Christmas break already! Just kidding, classes haven’t even started yet – that excitement would be a little bit premature. So why else would I be posting a Christmas cookie in September? For a contest of course, so bear with me, or bookmark this recipe and look back on it come December. Have you ever had a Terry’s Chocolate Orange? You know, the ones you smash to get them to fall open and then you can devour the little slices of orange flavoured chocolate? That was my inspiration for these Chocolate Orange Snow Caps. I’ve always loved the look of Chocolate Snow Caps, but wanted something a little bit more unique and festive for the holidays. I personally find that the flavour combination of chocolate and orange to be extremely festive and delicious. Begin by melting chocolate in a small bowl over a pot of boiling water. Set aside to cool. In a medium sized bowl, sift together flour, cocoa powder, baking soda and salt. Whisk the orange zest into the dry ingredients. In a large bowl or using the stand mixer, cream the butter and brown sugar until light and fluffy. Beat in the egg until fully mixed into the mixture. Next, beat in the chocolate. Fold in the dry ingredients until the dry ingredients are somewhat combined with the wet ingredients. Add 1 tbsp of milk to aid the process. Dough will be wet. Remove dough to a piece of plastic wrap and shape into a disk, chill in the refrigerator for 35-45 minutes. Meanwhile, preheat oven to 350 and line two baking sheets with parchment paper and prepare a bowl with your icing sugar. Remove dough from fridge and pinch of dough and shape into 1-inch balls – I used a cookie scoop as it made them more uniform in size. Roll the balls in the sugar coating and place on cookie sheet about 2 inches apart. The cookies will spread during baking. 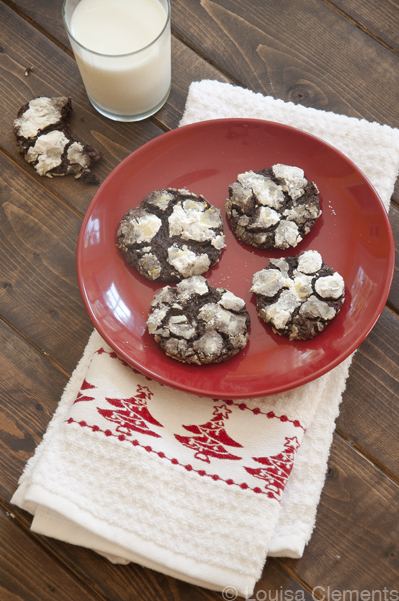 Bake for 10-12 minutes or until the cookies have spread and are cracked on top. The cookies will be soft to the touch. Allow them to cool completely before sampling. I hope you enjoy these Chocolate Orange Snow Caps.